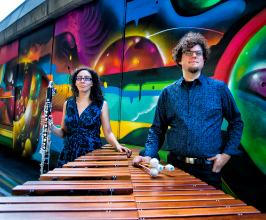 Hailed as "Superb" by The Boston Globe, Boston-based contemporary duo Transient Canvas (Amy Advocat, bass clarinet & Matt Sharrock, marimba) is dedicated to commissioning new works by living composers while curating adventurous and culturally relevant concert experiences. Their Collage programs represent a cross-section of current musical trends with a constantly changing selection of repertoire. For Chapman University, Collage features a selection of electronic and acoustic compositions that address a variety of challenges facing the word today from climate change to our current political landscape. Composers include Kirsten Volness, Osnat Netzer, Lansing McLoskey, Brian Sears, and Dan VanHassel.